Upholstery cleaning in Cheshire. Sofa’s, Suites, Chairs and most types of fabric cleaned. Perhaps your upholstery needs a new lease of life. Why not re-vitalise your furniture by using Cloverleaf Carpet Care – professional upholstery cleaners in Cheshire with more than 18 years of experience. Our superb upholstery cleaning system can brighten and restore the fabric to your sofa or suite by removing odours and most types of stains and soiling. Most types of fabrics can be cleaned including suedette (synthetic suede), cotton fabrics, chenille fabric and many more. Upholstery is cleaned with attention to detail and great care. The products we use dissolve the soiling which is then removed by high vacuum, hot water extraction as can be seen in the photo. Upholstery cleaning is labour intensive and time consuming. 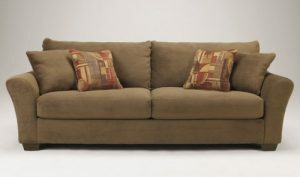 An average three piece suite, consisting of ten cushions can take up to four hours to clean due to the surface area. Therefore if you make an appointment for upholstery cleaners Cheshire, suites are best cleaned during a morning appointment so the fabric can be ready to use the following day. Perhaps you may need just a sofa cleaning or a single chair, no job is too small. We also clean dining room chair pads including commercial seating and larger communal bench seating. Depending on the amount of use, Upholstery can be cleaned annually or every few years which will keep it in tip top condition. 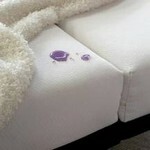 We can apply StainShield fabric upholstery protector at an additional cost. This is applied immediately after the upholstery has been cleaned. This will help any spillages to run off or bead on the fabric, therefore allowing time to deal with the spillage and avoid it soaking into the material. This service means that your upholstery will continue to look great for years to come. We also offer a comprehensive leather cleaning service in the Cheshire area. Read more about leather cleaning here. See the video opposite how your upholstery can be deep cleaned and made fresh and sometimes as good as new! Established in 2001 and providing both residential and commercial service coverage throughout the Cheshire area. Trained and certified by the National Carpet Cleaners Association. Fully insured and guaranteed. © Copyright 2012-2019 Cloverleaf Carpet Care. All Rights Reserved.